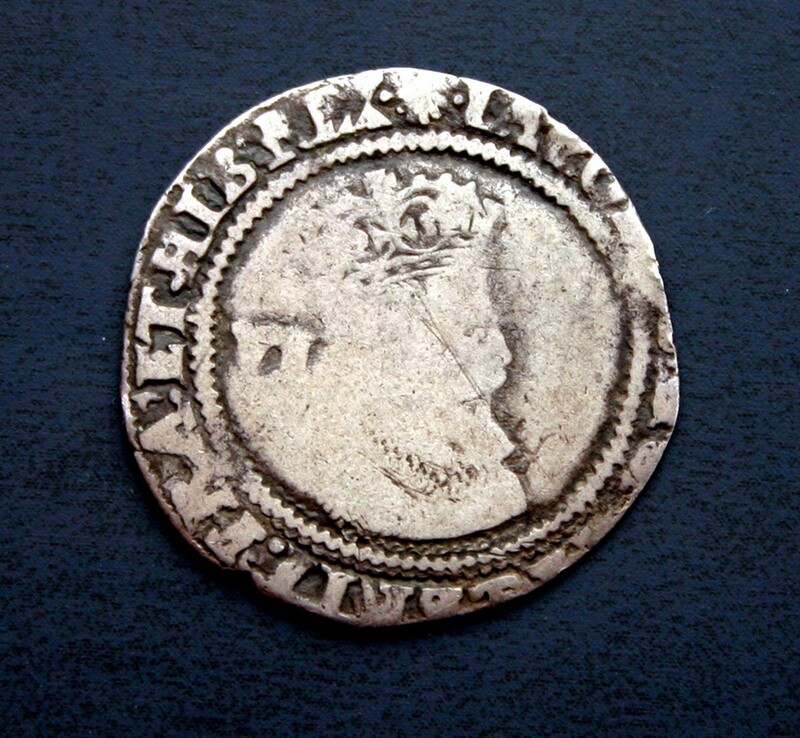 This coin is our first piece of currency for the island and whilst not being legal tender it has been based on coin of the realm from the reign of James 1st of England and 6 th of Scotland back in 1603. 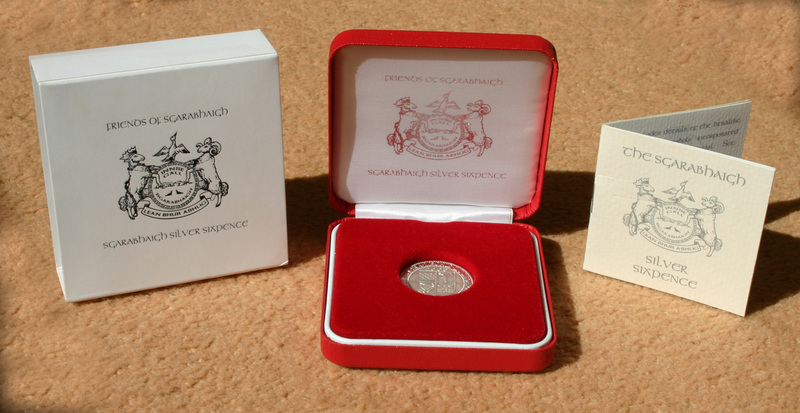 It has been struck in 'fine silver' which is 99.99% pure and incorporates in its design both historic links and key features of the project that is Friends of Sgarabhaigh.  a unique coin for that collector. Add to these Birthdays, Anniversaries, Graduations, Retirements, Mothers Day and Fathers Day as well as Christmas and particularly Valentines Day and you can see that the sixpence can be the answer to any 'need a present' situation. One thing you can be certain of - I'll bet they haven't already got one. This is the orginal James I coin on which our coin is based. 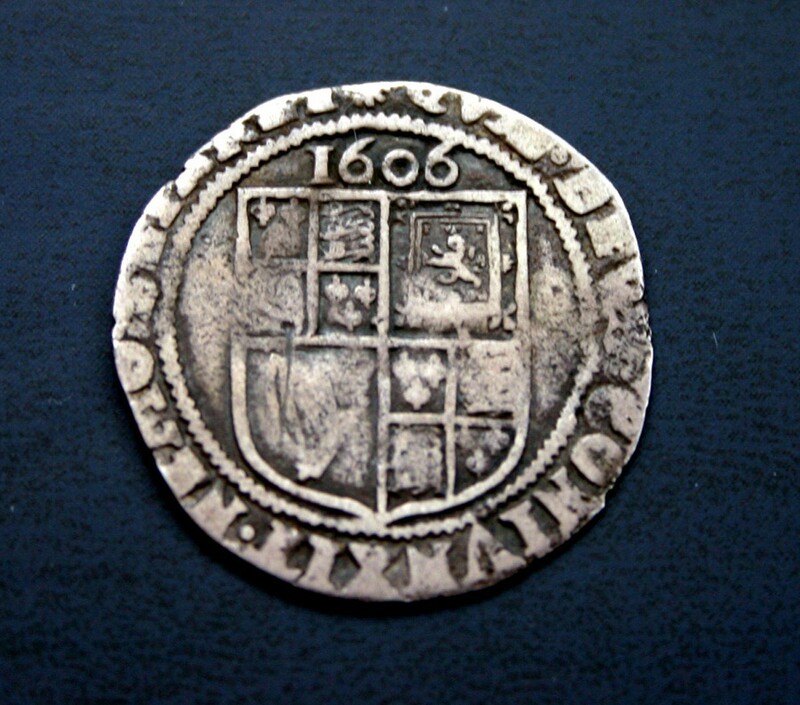 Most of us are not used to seeing or touching pure silver coins from the 1600's with their wafer thinness, un-milled edges and their lighter feel so we thought that the addition of a formal hallmark would overtly validate the purity of the coin and add ‘gravitas' to what is a most unique and unusual item. These official registration marks underpin both the provenance of the coin and add to its intrinsic charm with the delicacy of all four assay marks being individually stamped onto each coin after it has been struck.  a ‘ Britannia ' being the traditional UK symbol for silver. The four hallmarks are individually hand stamped onto each coin by the Assay Office staff using the lower stamp die to avoid any significant damage to the coin face. When you consider that the hallmarks are only about 1mm square they in themselves are wonderful little ‘works of art’. Click on any of the hallmarks you would like to see as it appears or for those of you who have your own coin just get your magnifying glasses out and marvel at the detail of each hallmark. 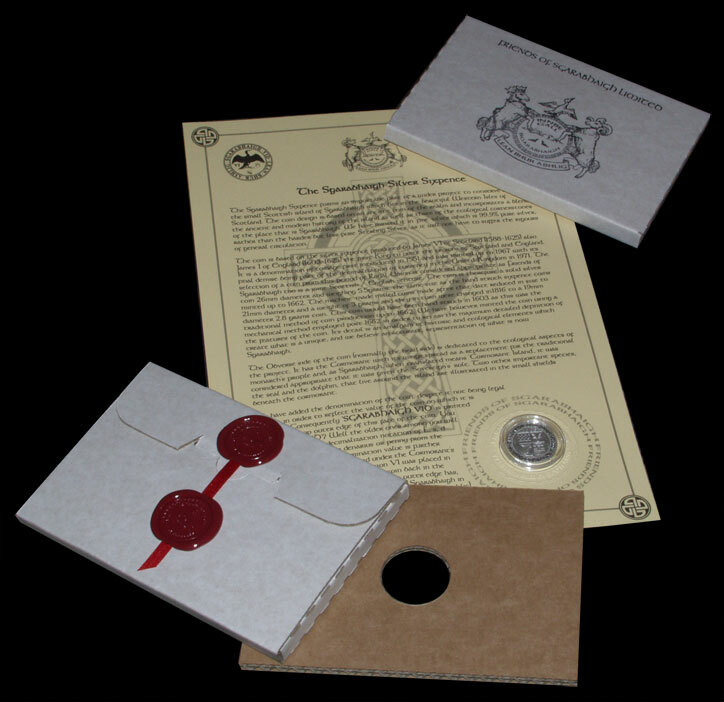 This version of the gift comes packed in a purpose made package sealed with ribbon and sealing wax and includes a signed Certificate engrossed with the project seal and provides the history of the development of the coin; the coin number and its minting reference. If you would like to read the full story behind the coin please click here. This version of the gift comes in a purpose made case annotated with the project crest and contained in a protective sleeve. Included with the coin is a small heritage booklet giving a precis of the story and history of the coin. The box comes in both red and blue and the blue version has become an attractive gift for the wedding market where it acts as the perfect gift for the bride as it provides the ' something old, something new, something borrowed, something blue and a silver sixpence for her shoe'. This is possible as it is based on an 'old' coin of the realm; it is from a 'new' minting; it has 'borrowed' the basic ancient design and it comes in a 'blue' box ; it really is a unique and very special gift. If it is passed down the ages as the brides of each generation use it for their own wedding and through this linkage it will become an important part of your family folklore as well as becoming a treasured family heirloom.